There is a major link between underdevelopment and the risk of conflict. The West’s most immediate foreign security threats come from organizations in fragile regions. 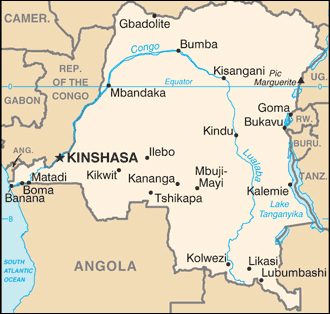 These regions suffer from weak governments, dismal economies, and violent conflict. 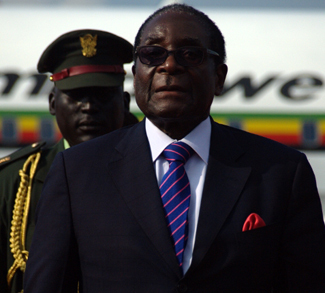 In Africa, weak governments, underdevelopment, and conflict seem to go hand-in-hand. As such, this region has a long history of instability and conflict, and has become a breeding ground for radical terrorist organizations. Since the end of the Second World War, Western politicians have often advocated for the spread of democracy as a means to promote political freedoms, stability, and prosperity in fragile regions. As such, the international community has worked to create the African Charter on Democracy, Elections and Governance, which was adopted by the African Union (AU) in 2007. Nearly a decade after its creation, twenty-three states have signed and ratified the Charter, twenty-three states have signed but have not ratified the Charter, while seven African Union members have not signed or ratified the Charter. Although there are fifty four member states in the African Union, the analysis does not include the Sahrawi Arab Democratic Republic, as it is not fully recognized by the international community as an official state and sufficient data is lacking. Throughout the analysis, ten progress indicators are used – three measures of political institutions, three measures of economic progress, two measures of human development, and two measures of combat deaths – to determine whether the Charter has been successful in achieving international objectives. The three political indicators – obtained from Freedom House’s Freedom in the World data set – measure the number of electoral democracies, the political rights, and civil liberties in each country. In terms of political rights and civil liberties, the lower the score, the greater the political freedoms, with 1 being the greatest degree of freedom and 7 being the lowest degree of freedom. The economic indicators look to determine the per capita GDP, per capita GDP growth rates, and the degree of income equality (the lower the Gini index, the more equal the society). The development indicators measure the annual life expectancy at birth and the number of under five-year old deaths per year in each country. I also use data from two sources to track the number of annual battle deaths. The analysis examines whether countries that have ratified the Charter have made substantial progress over and above the progress made by countries that have not ratified the Charter. The fifty-three countries are broken up into three groups: the twenty-three countries that have ratified, the twenty-three countries that have signed but have not ratified the Charter, and the remaining seven countries that have not signed or ratified the Charter. As the aim is to determine whether the Charter has benefited the African region, the ten progress indicators are used to determine whether progress has been made since 2007 (when the Charter was adopted by the AU). Although relative improvements are one of the main determinants of whether the Charter has been successful, the analysis will also considers which group of countries are better off in absolute terms. The summary of the quantitative analysis is presented in Tables 1-4. In order to determine the effectiveness of the Charter, the tables illustrates whether each group has made improvements or has regressed since 2007. For convenience, I have highlighted improvements made since 2007 in green, and have highlighted regressions in orange. According to the data presented in Table 1, it appears that ratifying or signing the African Charter on Democracy, Elections and Governance has not improved the number of electoral democracies or the degree of political freedoms among participating countries. In fact, the only group of countries that have experienced a greater degree of political freedoms since the creation of the Charter were the countries that did not sign or ratify. Furthermore, the countries that have not signed or ratified the Charter were the only group of countries that saw an increase in the amount of electoral democracies since 2007. Countries that signed or ratified the Charter actually saw a reduction in the number of electoral democracies. With regards to civilian’s political rights, again, only countries that have not signed or ratified the Charter saw an improvement. Civilians living in either countries that have signed or ratified saw reductions. As illustrated in Table 1, no group of countries have made any improvements in their civil liberties. However, only the countries that have not signed or ratified the Charter did not experience a reduction in civil liberties. Since 2007, countries that have not signed or ratified the Charter have made the greatest improvements in political institutions. However, in absolute terms, civilians living in countries that have either signed or ratified the Charter live with greater political freedoms. This cannot be attributed to the implementation of the Charter, as these countries had greater political rights and civil liberties prior to its creation in 2007. After examining the data presented in Table 1, I cannot conclude that signing or ratifying the Charter has resulted in greater improvements in the degree of democratic institutions or political freedoms. Although the only group to make improvements in terms of the political indicators were the countries that have not signed or ratified the Charter, it appears that all countries have made improvements in their standard of living, as measured by per capita GDP. Figure 1 graphs the three groups of countries’ average annual per capita GDP since 1991. According to Figure 1, it is apparent that the countries that have not signed or ratified the Charter have the greatest standard of living among all African Union members. The economic indicators illustrated in Table 2 and Figure 1 suggest that signing or ratifying the African Charter has not resulted in significant improvements in economic well-being. In fact, the countries that have had the most economic success are countries that have not signed or ratified the Charter. 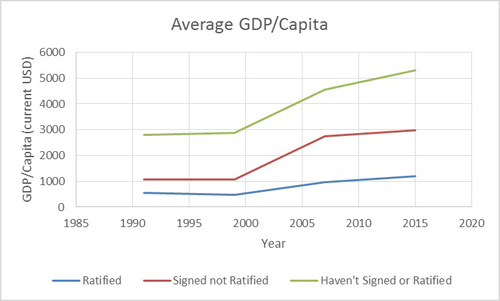 In 2015, countries that have not signed or ratified the Charter had an average per capita GDP nearly 4.5 times greater than those that have ratified the Charter. Although the countries that ratified, on average, have the lowest per capita GDP, they have experienced the greatest growth since 2007. However, the relatively large growth rates do not represent significant economic progress. Instead they are best explained by their low per capita GDP prior to 2007. The countries that have ratified the Charter have agreed to implement policies that encourage economic equality (Article 33). However, Table 2 illustrates that the only group of countries that have reduced income inequality since 2007 are those that have not signed or ratified the Charter. The ratification of the Charter does not appear to have promoted an equitable distribution of income. According to the data illustrated in Table 2 and Figure 1, countries that have not ratified the Charter appear to be enjoying the greatest economic success, while countries that have ratified continue to have struggling economies. The economic indicators suggest that ratifying the Charter has not resulted in major improvements in economic well-being. All countries have experienced major human development improvements since the creation of the African Charter in 2007. As illustrated in Table 3, countries that have not signed or ratified the Charter have the longest life expectancy, and the fewest number of early childhood deaths. However, the greatest improvements – in terms of life expectancy – have been made in countries that have ratified. Yet, these countries remain the worse off. Between 2008 and 2015, the average life expectancy for people in countries that have ratified was 8.45 years less than those living in countries that have neither signed nor ratified the Charter. Similar to life expectancy, Table 3 illustrates that all groups of countries have seen improvements in early childhood deaths. However, countries that have not signed or ratified the Charter have made the greatest reductions. Between 2008 and 2015, ratified countries have experienced an average of 42,957 more early childhood deaths per year than countries that have only signed, and 55,761 more childhood deaths than countries that have not signed or ratified. Although countries that have ratified the Charter have made development improvements, the improvements made by those that have not ratified have been more impressive. The limitations of conflict data are well known. Data was acquired from two well-respected sources in order to increase confidence surrounding the findings. Although both sources report a different number of casualties, the trends are very similar. All groups of countries have experienced reductions in average annual battle related deaths since 2007. According to both sets of data presented in Table 4, countries that have ratified the Charter have experienced only small reductions in battle related deaths since 2007, while those that have not ratified have experienced significantly greater reductions. According to the data collected from the World Bank, the countries that have not signed or ratified the Charter experienced an 88.5 percent reduction in annual average battle related deaths since the adoption of the Charter. Whereas those that have ratified have only experienced an 18.6 percent reduction. Since the creation of the charter, the number of deaths decreased, on average, by 5,114 per year within countries that neither signed nor ratified. Those that ratified experienced only 124 less annual deaths since 2007. Although I cannot make the claim that not ratifying the Charter has resulted in major reductions in combat related deaths, it is clear that, on average, ratifying the Charter has not resulted in major reductions in conflict. According to the data presented in Tables 1-4, it appears that the countries that have ratified the Charter have not made significant improvements relative to the countries that have not. Although ratified countries have experienced greater growth in average annual per capita GDP and annual life expectancy, it should not be concluded that the ratification of the Charter has led to substantial improvements. The relatively large increase in annual growth rates is better explained by the low starting per capita GDP, rather than any substantial improvement in economic potential. Due to the low initial per capita GDP, any small improvement will be magnified through greater growth rates. The countries that have ratified have also experienced greater improvements in life expectancy. Yet, their average annual life expectancy still remains nearly 8.5 years lower than in countries that have not signed or ratified the Charter. Countries that have not signed or ratified the Charter have experienced greater improvements in the number of countries with electoral democracies, political rights, income equality, and reductions in early childhood and combat related deaths. Furthermore, these countries have much longer average life expectancies, and their per capita GDP is approximately 4.5 times greater than the countries that have ratified the Charter. Since 2007, it cannot be concluded that the countries that have ratified the Charter have experienced greater institutional, economic, developmental, or conflict related improvements than the countries that have not. 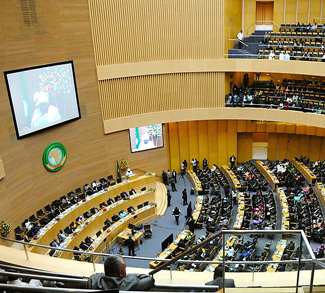 The African Charter alone has not generated great improvements among African Union members. The fundamental failure of the Charter is that it does not have the ability to alter the incentives and opportunities available in these countries. The result has been no substantial social change. The lack of enforcement partly explains why the Charter has failed to bring substantial gains to the Parties that have ratified the agreement. There remains a clear time-consistency problem, where leaders of a country can agree to abide by the liberal democratic institutions in place, and then defect on their promise whenever it is in their short-term interest to do so. 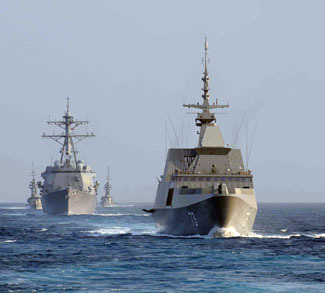 Other actors within these countries – leaders of other factions, potential investors, and civilians – understand that the lack of enforcement allows leaders to defect from their agreement to uphold the Charter. The other actors then realize that it is also in their best interest to defect from the agreement. For example, instead of respecting the outcomes of an election, rival factions will predict that the current leader does not have the incentive to abide by electoral rules. Instead of peacefully abiding by electoral rules, other factions have the incentive to acquire state power through force. In fact, there are numerous examples of this situation occurring. According to the National Democratic Institute, between 2007 and 2013, ten military coups in Western Africa had taken place in countries that have ratified the Charter. Once defection from the principles of the Charter becomes beneficial and inevitably occurs, other groups no longer benefit from adhering to the Charter. Without an enforcement mechanism to make the agreement credible, the Charter is unlikely to significantly improve the standard of living in Africa.